Did you ever wonder what a alligator would look like if it was in freezing, or frozen water. Here is footage of a alligator in a frozen cypress swamp down south after the frigid bomb cyclone battered the entire east coast the first week of January 2018. The alligator in this video stayed in the water with his nose above the water so it could still breath as the water froze around it’s snout. 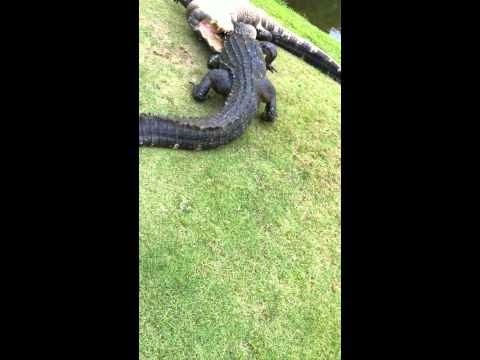 Here is old video footage from 2011 that is trending now of two 11 foot plus alligators fighting at the Eagles Golf Course in Tampa, Florida. Certainly something you don’t see everyday.